Built by Beau Nash with magnificent terraces, elegant Town houses, and big corner mansions (where the dukes live, of course) Moonlight Square is rumored to be Regency London's most romantic address. Certainly, it's one of its most scandalous! England, 1817. Lady Portia Tennesley has always dreamed of marrying for love. When the suitor who seemed her perfect match disappears at the height of the Season, she’s heartbroken. Eventually she consents to an arranged marriage with an eccentric duke she barely knows, a wealthy recluse who seems more interested in science than spending time with his new fiancée. But before Portia walks down the aisle to her grand, loveless match, she turns to the only man who can uncover her former beau’s fate—the mysterious outlaw known as Silversmoke. On your left stands the Grand Albion, an opulent hotel based on the Pulteney Hotel of Regency times, mashed-up with Almack's on King Street, for, you see, the Grand Albion boasts a fine ballroom on the first floor, with a weekly subscription ball throughout the Season. On the ground floor, in the back, you will find the local gentlemen's club. Just hope that your name does not end up in the wager book. Shall we take a stroll along the graveled walks? The flowers and plane trees are so pleasant in Spring. But don't be surprised if we find some couple madly in love stealing a moment alone in the garden folly...more fodder for tea-time with the ladies! Coming out of the park, we now stand in the shadow of St. Andrew's Church with its picturesque steeple. Much like St. George's in Hanover Square, it's one of the most fashionable spots to get married in London, as our local bachelors seem to be learning. Try as they might to avoid it, they do have a way of ending up there at the altar, saying "I do." 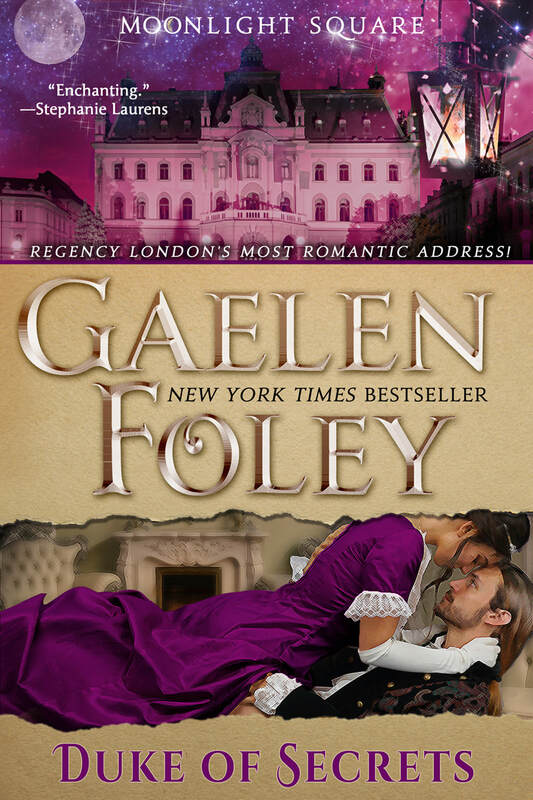 Presenting the wildly romantic new Regency series from New York Times bestselling author, Gaelen Foley… Welcome to Moonlight Square ~ Regency London’s Most Exclusive Address! At the ripe old age of two-and-twenty, Lady Katrina Glendon just can’t seem to snare a husband. Whether her frank tongue or slightly eccentric ways bear the blame, she faces a houseful of younger sisters clamoring for her, the eldest, to marry and move aside before they all end up as spinsters. When her latest suitor defects and proposes to another girl, Trinny throws up her hands in despair of ever finding a fiancé. But sometimes destiny waits just around the corner…and love lives right across the square! 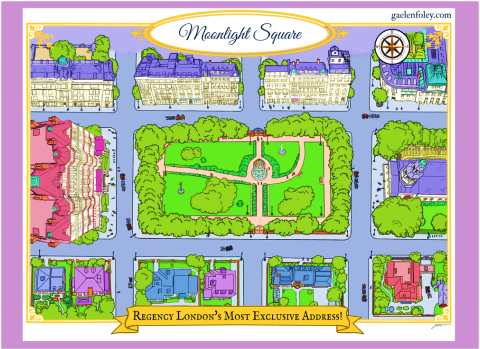 Welcome back to Moonlight Square ~ Regency London’s most exclusive address! Jason Hawthorne, the Duke of Netherford, made it clear to the young, lovesick Felicity Carvel long ago that nothing could ever happen between them. He has earned his reputation as the Duke of Scandal—and she’s his best friend’s little sister. He vows for honor’s sake to stay away from the lovely innocent. But six years of the wealthy libertine’s life have left Jason empty and jaded, while Felicity has blossomed into a strong, beautiful woman, ripe for love and marriage. When a sudden windfall makes her one of the most sought-after heiresses in London, chased all over Town by fortune-hunters, Jason knows he must keep the rogues at bay until her brother returns from his dangerous mission abroad. But the scandalous attraction between them has only grown to a searing intensity. And deep down, Felicity still wants Jason for her own. After getting her heart broken by Naughty Netherford once before, does she dare attempt to play with fire again—and this time, can Jason resist? Everything Lady Serena Parker thought she knew about her own life has just proved a lie. Now, only one man can lead her to the truth… But at what price? Subscribe to my newsletter for further announcements about all my upcoming releases. He’s the Duke no one expected. She’s the Lady he’s been looking for. Can their love overcome the dark storm gathering over the House of Amberley? London, 1817. Rugged, roguish Major Connor Forbes has just received the surprise of a lifetime. After returning from the front lines of the Napoleonic Wars, the Irish-born warrior has just learned he’s the heir to an English dukedom. The only problem? The last three Dukes of Amberley all died under very mysterious circumstances, and before long, Connor is convinced that someone is trying to kill him. As he attempts to survive his new title and navigate life in the London aristocracy, he knows he needs the guidance of a high-society insider…but whom could he possibly trust? As Connor and Maggie search for clues together in the London ton, they can’t help but grow closer. To him, she embodies a battle-hardened soldier’s dream of peacetime. To her, he calls forth the adventurous streak she didn’t know she possessed. But can their fragile bond survive Connor’s cursed inheritance, or will a vengeful assassin and family secrets buried deep within the House of Amberley destroy their chance at happiness?